Oh the sweet story of dream catchers! It is said that the Native American Dream Catcher, was devised by the Woodland group of Native Indians as a protective charm or device, originally for the children of the tribes. It was believed to protect a person from bad dreams and nightmares. The dream catcher was constructed in a spider web design using a wooden hoop that was attached to a woven web or loose net, so it looked like a spider’s web. The dream catcher It was then decorated with sacred and personal objects such as feathers and beads. 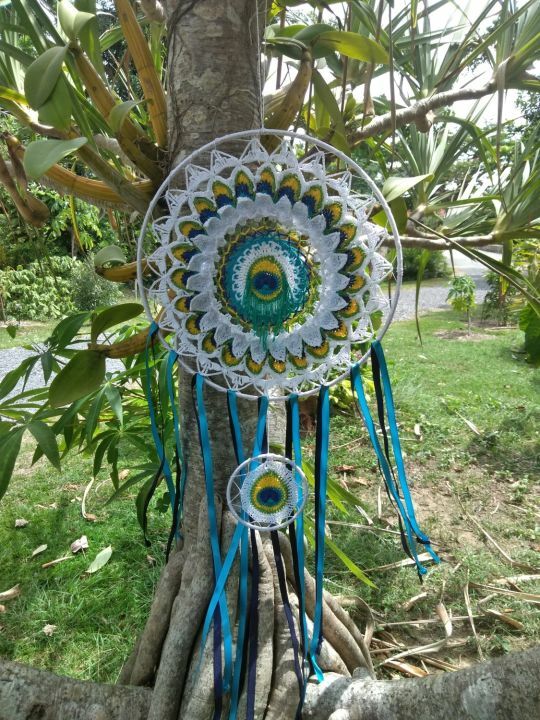 Create this beautiful peacock dream catcher to brighten your home and keep the good vibes.Traditional dream catchers had small shells, as well as feathers, attached as ornaments. As time passed other ornaments such as glass beads or semi-precious stones were added. You can add as many embellishments to your dream catcher as you like. Join us in the “Peacocks In Bloom” crochet along to get this free pattern.